There’s nothing quite like the weather in…February? And although everyone seems to be enjoying the spontaneous springtime weather, it’s important to remember that we’re still in the peak of flu season. Given such, it’s vital to take the right steps to prevent catching the virus. The Center for Disease Control and Prevention (CDC) has outlined three simple actions you, and those closest to you, are urged to follow – starting with getting a flu vaccine. In reality, I’m sure we all know people who forego the recommended yearly vaccine. However, due to the various flu viruses attainable, the vaccination plays a major role in reducing flu-related hospitalizations, illnesses, and missed time. This is especially the case for people with chronic health conditions, pregnant women, and children; as they are at higher risk of the flu. Though one may be averse to needles, that’s nothing your favorite song or podcast can’t get you through. Along with avoiding touching facial features to deter germ spread, it’s wise you keep a bottle of sanitizer handy, and a few wipes for good measure. Finally, the last method is if you do contract the flu, you may need to take flu antiviral drugs, as prescribed by your doctor. And, if you have not had a flu vaccine but have had close contact with someone that has the flu, your doctor may also recommend antiviral drugs. Studies show that antiviral drugs garner the best results when started within two days of getting sick or being exposed to the flu virus. Therefore, in the unfortunate case that you contract the flu, or you are unvaccinated and have been in close contact with someone that has the flu, it’s best to reach out to your doctor immediately and follow his or her instructions to best treat your illness. Your doctor can help figure out a treatment plan to help you get good and healthy once the true springtime weather rolls around! Dr. Randi Protter is a physician at R-Health Ewing. 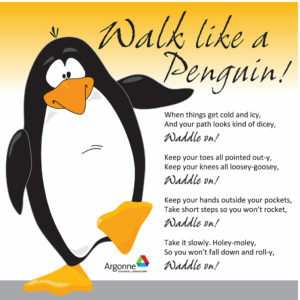 During the winter months, it is important to remember key tips to stay safe walking in icy and snowy conditions. We’ve put together a short checklist of some tips to keep you safe – many of these tips we’ve learned from penguins and the way they waddle across the ice. Take short, slow, shuffling steps. Point your feet out to the side. Spread your feet out so that it increases your center of gravity. Walk flat footed and wear shoes with tread. Look ahead and extend your arms out to maintain balance. When on steps, always use the hand railings. Be careful when entering and exiting vehicles and hold on for support when stepping out of the vehicle. Take your time – allow any extra time that may be needed in icy conditions. And if you do fall, remember to tuck and roll. If you find that you are slipping, tuck into a ball to make yourself as small as you can and protect your head and face from the fall. Don’t use your hands to catch yourself, try to land on the fleshy parts of your body. Still have questions? Contact your R-Health doctor for more tips. R-Health, a leader in innovative healthcare solutions, today announced that 11 value-based practices supported by R-Health were accepted into the Comprehensive Primary Care Plus program (CPC+), a partnership between payer partners from the Centers for Medicare & Medicaid Services (CMS), state Medicaid agencies, commercial health plans, self-insured businesses, and primary care providers. R-Health, through the company’s accountable care service division, supported 11 local practices to apply for the program and all were accepted. Each of these practices are part of one of R-Health’s accountable care organizations, Care is Primary ACO or ACCO. These practices join the more than 2,900 primary care practices nationwide participating in CPC+. This partnership is designed to provide improved access to quality health care at lower costs. Through CPC+, CMS will pay primary care practices a care management fee, initially set at an average of $15 per beneficiary per month in Track 1 and $28 per beneficiary per month in Track 2, to support enhanced, coordinated services on behalf of Medicare fee-for-service beneficiaries. Simultaneously, participating commercial, state, and other federal insurance plans are also offering enhanced payment to primary care practices designed to support them in providing high-quality primary care on behalf of their members. For patients, this means that physicians may offer longer and more flexible hours; use electronic health records; coordinate care with patients’ other health care providers; better engage patients and caregivers in managing their own care; and provide individualized, enhanced care for patients living with multiple chronic diseases and higher needs. The five-year model started on January 1, 2017, with CMS soliciting a diverse pool of commercial health plans, state Medicaid agencies, and self-insured businesses to work alongside Medicare to support comprehensive primary care. Public and private health plans in 14 regions across the country signed letters of intent with CMS to participate in this model: Arkansas, Colorado, Hawaii, Kansas and Missouri’s Greater Kansas City region, Michigan, Montana, New Jersey, New York’s Capital District-Hudson Valley region, Ohio and Kentucky’s Cincinnati-Dayton region, Oklahoma, Oregon, Pennsylvania’s Greater Philadelphia Region, Rhode Island, and Tennessee. The markets were selected in August 2016 based on the percentage of the total population covered by payer partners who expressed interest in joining this partnership. Eligible primary care practices in each market were invited to apply to participate in the winter of 2016. Through a competitive application process, CMS selected primary care practices within the selected markets to participate in CPC+. Practices were chosen based on their use of health information technology; ability to demonstrate recognition of advanced primary care delivery by leading clinical societies; service to patients covered by participating payer partners; participation in practice transformation and improvement activities; and diversity of geography, practice size, and ownership structure. CPC+ is administered by the Center for Medicare & Medicaid Innovation (CMS Innovation Center). The CMS Innovation Center was created by the Affordable Care Act to test innovative payment and service delivery models that have the potential to reduce program expenditures while preserving or enhancing the quality of care. In addition to supporting the application process, R-Health will assist each of the practices in implementing and managing their participation in the program. This will include reporting requirements, data analytics, workflow re-design, and best practices for care management.